Only 4% of organisations describe their website experiences as ‘very’ personalized. Around three quarters understand the importance of personalization, but ‘don’t know how to do it’. Taken to its logical extreme, providing a completely personalized shopping experience to every potential buyer seems like a pipe dream. It's often hard enough to get a single good experience, let alone one that morphs itself to the whims of each individual buyer. So let's start by breaking down the problem. What are a couple things that you can do right now to deliver a more personalized shopping experience to your audience? Before breaking the big problem of personalization in e-commerce down to smaller, achievable tasks, let's start by revisiting the goals of personalization. 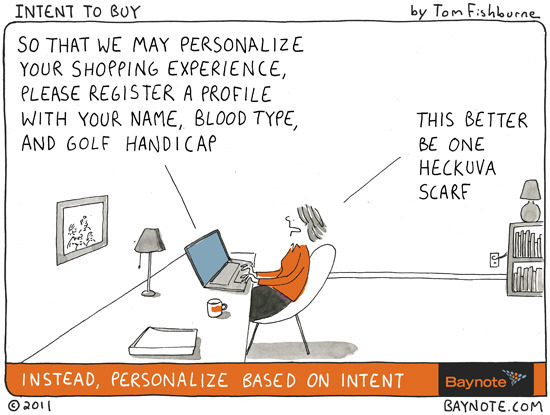 For starters, the goal is not to deliver a personalized shopping experience for every user! That insight seems to be lacking. Personalization for personalization's sake isn't itself the goal. Instead, the goal is to use personalization as a tactic to increase overall store performance. Seen from this light, if you want to deliver a highly successful shopping experience that is personal—rather than a highly personalized shopping experience that is successful—you can start with small projects. Use personalization tactics to increase engagement, cart size, and conversion rate. Introduce them slowly so that you can measure their impact. Iterate. Successful personalization means several small projects instead of one bigger project. So that said, here are a few, small personalization projects that your team can take on and experiment with on your site to deliver measurable results for your business. Amazon.com has been doing this almost from the beginning. It's so simple, and yet tons of sites don't do it. Simply greet people who have been to your site before. The biggest mistake that companies make here is to assume that a customer must log in before being able to greet them. However, this is just not true. One of the most brilliant things Amazon did early was to always greet you, even if you're not logged in. Remember the, "Hello Rob! (not Rob? click here!)" They start assuming that a web browser tends to be used by a single person most of the time. You can get fancier if you want. For example, throw in a "Welcome back, Rob! We've missed you." if a shopper hasn't visited in a while. Just remember to greet everyone that stops by. This is another super simple feature. Amazon does this, but they bury it waaaay at the bottom of the page, and I would put it above-the-fold, almost as a navigation option. If a shopper has clicked through to a couple items, it helps to remind her about them. After all, she indicated interest; a quick reminder could encourage her to buy, and it at least shows that you're paying attention. You could try a variant of this which would be recently viewed categories instead of recently viewed items. Use it as a set of hot links above your normal category navigation for a particular user. GoodReads does this best. 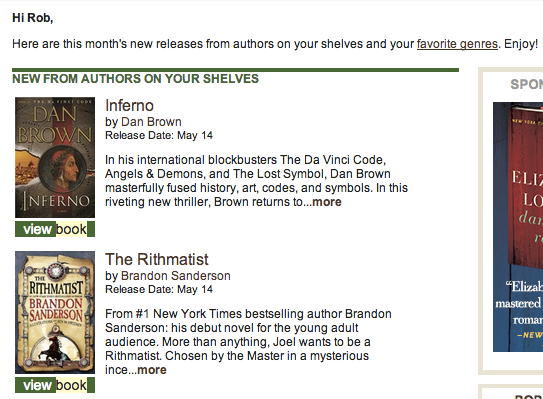 If a new book comes out from an author that I've read and rated highly then GoodReads lets me know. 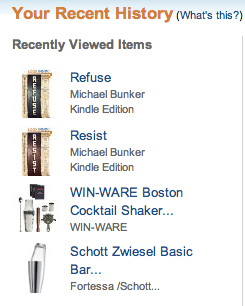 I've discovered a bunch of new books this way, and I love getting the emails. They are helpful. When a new product comes out that's closely related to something I've purchased on your site, let me know! For example, if I spent $1000 on a Nikon camera and a new, fantastic lens comes out that works with it, let me know! I hope you're enjoying your Nikon. I just wanted to let you know that the new Nikon Wide Angle Super Lens, which is compatible with your camera, just came out. These are just a couple examples that seem like low-hanging fruit to me, but I'm sure there are tons of others. The key to delivering personalization in e-commerce shopping isn't to deliver one massive thing all at once, but instead to think of little things that can improve the shopping experience over time. If you add 5-10 little personalization features, you may find yourself with a highly personalized shopping experience that is the envy of your competition who are still stuck at "that would be great, if only..."